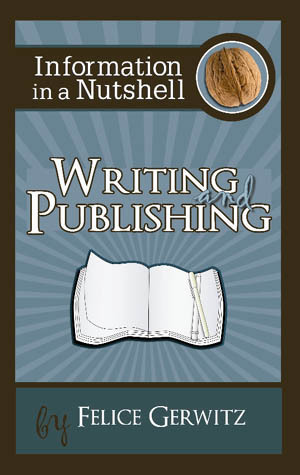 Whether you are already a successful, published author or a “wanna-be” writer, there is a wonderful resource for writers by Felice Gerwitz, Information in a Nutshell: Writing and Publishing. Sharing her own personal writing and publishing journey, Felice gives very practical and extremely encouraging information to help you on the road to writing and publishing your book – whether you choose to go with the traditional publishing route or through self-publishing. I sat down to read this book late one evening after a long, busy day, and did not put it down until I finished it that night – read it in one sitting on my living room couch! This book includes chapters on researching information for writing your masterpiece, writing queries and proposal letters, finding good literary agents, marketing, getting expert advice, and giving you many, helpful recommended resources. It is packed with great information on the writing and publishing process, all within 127 pages. I love Felice’s honest, refreshing, uplifting writing, and especially enjoyed her sharing her personal path to publishing her books – both what she did right and the mistakes she feels she made. You can check out her other books and resources at Media Angels. She also has a Blog Talk Radio show each week on writing and publishing that I just love listening to called Information In A Nutshell.